Kangaroos are marsupials which belong in the genus Macropus, part of the Macropodidae family. Marsupials differ from placental mammals (apes, dogs, cats etc.) in that they have a short gestation period and give birth to relatively undeveloped young. The young (in this case a ‘joey’) then spends a period suckling on the mother’s teat, where it gains the necessary nourishment to develop and grow. 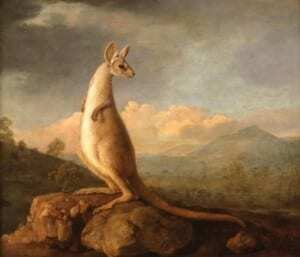 There are four known species of kangaroo, all of which are native to Australia; the red kangaroo, the the eastern grey kangaroo, the western grey kangaroo and antilopine kangaroo. Well-known physical characteristics shared by all kangaroos include their large feet, long tails and of course their pouch. It turns out they are very interesting on the inside, too. Today’s blog will explore how their stomachs are adapted to their diet and the challenging climatic conditions they live in. All terrestrial kangaroos (kangaroos that live on the ground) are strict herbivores. They regurgitate and re-chew digesta on an occasional basis which, to the informed reader, might sound an awful lot like rumination. However this process – known as ‘Merycism’ – differs from rumination in a number of ways. Rumination is the process by which cows, sheep and goats extract nutrients from their food, regurgitating partially chewed food and eventually swallowing it again. 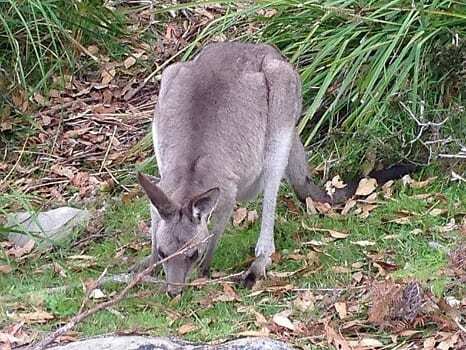 (1) Kangaroos however do not need to regurgitate their food, and do so only occasionally. (2) A study conducted by the University of New South Wales Animal Care and Ethics Committee (ACEC) found that merycism seemed to cause kangaroos distress and tended to occur when they were fed pellets, as opposed to hay. They do however share some similarities with ruminants in the way their stomachs break down food. Kangaroos have two stomach chambers; the sacciform and the tubiform. The sacciform chamber contains bacteria, fungi and protozoa that begin the fermentation process necessary for digestion. During this process kangaroos may spit up bits of undigested food to be chewed and then swallowed again, much like a cow. As the food ferments, it passes into the kangaroos second stomach chamber, where acids and enzymes finish digestion. (3) Kangaroos therefore have modified stomachs which allow them to break their food down although this is all done in one stomach with two chambers, not four separate stomachs like a cow. Their specially designed stomach allows them to extract 70% of the energy from fibre digestion (4), which is more than cows. Kangaroos need very little water to survive and can go weeks, or even months, without drinking water. As all species of kangaroo experience frequent dry spells this adaptation is crucial to their survival. You may be asking at this point how they survive with very little water in such a challenging climate and the answers lie, once again, on the inside. By digesting their food slowly they are able to draw every last drop of moisture from their food before disposing of the waste. (5) Additionally, they are crepuscular animals which are most active at dusk and dawn. By limiting their activity to these cooler periods they are able to conserve water. Another way in which kangaroos different from ruminants is that they produce almost no methane during digestion. The bacteria in their stomach turns hydrogen into acetate, not methane. A study conducted by the Commonwealth Scientific and Industrial Research Organisation (CSIRO) investigated this process, with project leader Professor Mark Morrison stating a long term goal of redirecting feed digestion in livestock away from methane formation by using the bacteria in kangaroos which help produce acetate. (5) The impact the beef industry is having on the environment is well-documented (this BBC article suggested we need to cut out consumption by 90%) and many Australians are now looking at kangaroo meat as an environmentally friendly alternative. 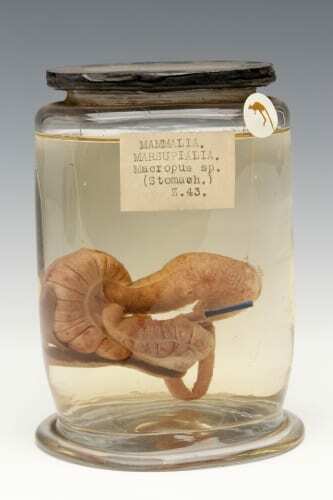 I hope my blog today has helped you understand why we have objects like kangaroo stomachs on display. By comparing these specimens with others we can explore the diversity of the animal kingdom and look at different parts of animals in great detail. Basically it’s not all about displaying the gory bits – but we do like that too.